Conor mcgregor’s detractors will be licking their lips this morning. With Jose Aldo withdrawing from UFC 189 due to injury, McGregor will instead face Chad Mendes in the main event in Las Vegas on 11 July. Aldo would have represented a significant test for McGregor, but a bout against Mendes is one that many fans have wanted to see for a long time. According to those who haven’t quite been convinced by McGregor’s spectacular rise to the top, the Irishman has yet to be tested by an elite wrestler. In the featherweight division, wrestlers don’t come much more elite than Chad Mendes — a two-time NCAA Division One All-American. 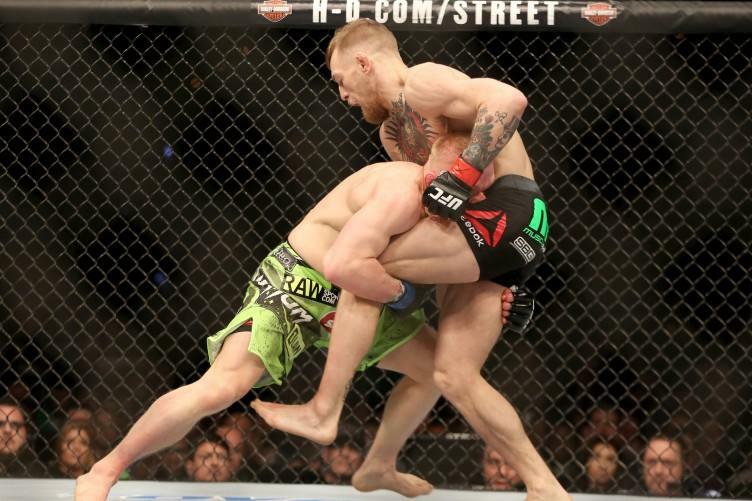 According to McGregor’s wrestling coach, however, that won’t be a problem. Sergey Pikulskiy has been working with McGregor since joining Dublin’s Straight Blast Gym team in 2008. Pikulskiy hails from Moldova and wrestled for his national team for seven years. He has an extensive background in both freestyle and Greco-Roman wrestling, and is currently playing a key role in McGregor’s training camp. “Conor’s been wrestling since day one when I came to SBG. From the start he picked things up right away. He’s probably the only person who never missed a wrestling class,” Pikulskiy told The42 from Las Vegas this morning. “Because he’s a great striker, people haven’t seen his wrestling yet. But he’s very good, whether it’s throws, takedowns or defence. Conor has been wrestling for many years now. “In the fight I think it’s going to be tough for Chad. He’s shorter, about my own size actually, so I know what kind of pressure Chad will feel in this fight. “People are always going to talk, but if you’re comparing Conor now to many years ago when he had just started [McGregor suffered two submission losses early in his career], he’s totally different. A different animal altogether right now. Jose Aldo may no longer be the opponent, but Conor McGregor now potentially has the opportunity to silence even more doubters than he would have had against the Brazilian.